The IEEE Communications Society embraces science, technology, applications and standards for information organization, collection and transfer using electronic, optical and wireless channels and networks, including but not limited to: Systems and network architecture, control and management; Protocols, software and middleware; Quality of service, reliability and security; Modulation, detection, coding, and signaling; Switching and routing; Mobile and portable communications; Terminals and other end-user devices; Networks for content distribution and distributed computing; and Communications-based distributed resources control. The vision of the society is to be the organization of choice for communications professionals throughout the world. The International Conference on Communications, among others, is sponsored annually. If you wish to purchase additional copies of publications included in your membership, please contact www.ieee.org/contactcenter. Membership includes the Essential Package. 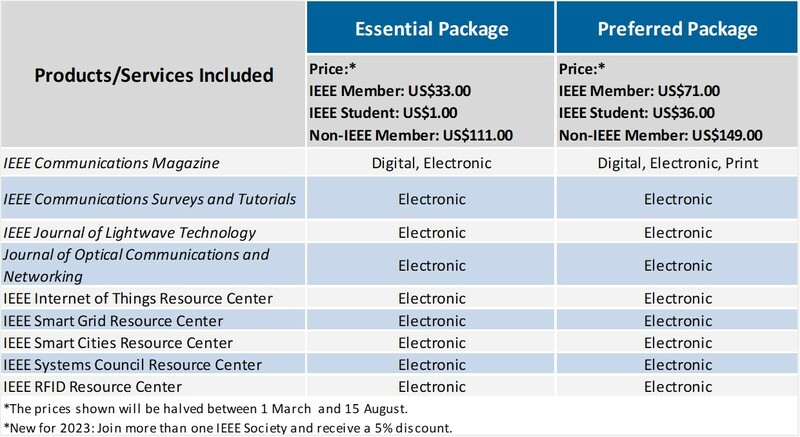 To select the Preferred Package, select 'Customize Options' in your cart at checkout and add IEEE Communications Magazine (print) for an additional US$19 for members or US$13 for students.